The Axis Mundi (also cosmic axis, world axis, world pillar or world tree) appears in many cultures and religions around the world. Although it may be expressed in different forms and images it is consistent in its usage. The axis mundi is the connecting point which unites the Heaven and Earth, and sometimes Underworld, around which cosmology and mythology circles. The axis mundi can take many forms; they can be natural high places such as Mt Fuji or Mt Olympus, buildings both religious and secular such as pagodas, they can also be plants such as trees or man-made constructions such as wooden poles. The axis mundi is both masculine and feminine in appearance. It is a phallic symbol, as are many of the forms that the axis mundi take, but it can also be seen as a feminine symbol in the form of the nourishing umbilical cord. It is a shamanic tool for travelling between realms of existence and for transmitting energy and communication through the realms. The axis mundi can be found at the centre point of a number of different shapes and symbols. For example, we can find it in the centre of the compass, or equal-armed cross. As the centre point rises and descends the universe is connected, as occurs in the Lesser Banishing Ritual of the Pentagram. The centre of the spiral can also a representation of the axis mundi, with the universe rotating around a central point or pillar. 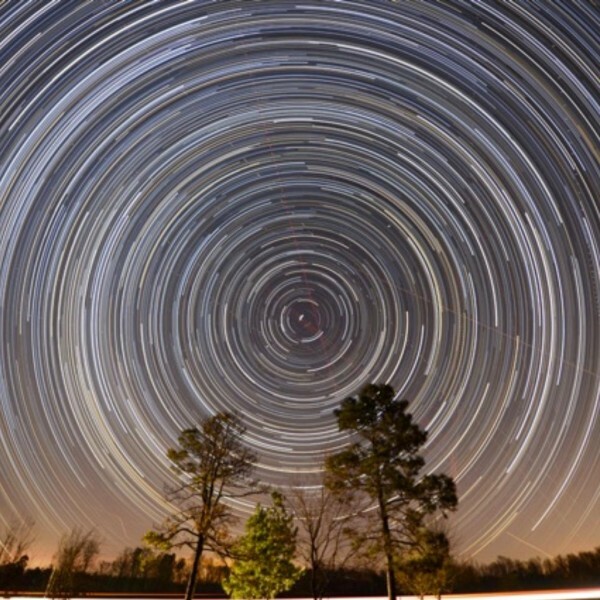 We can see this when we look at the North Star and the way that the stellar skies spiral around this single point in the night sky. When a sacred space is cast, a separate and distinct cosmology to that of the world around us is created. When we stand at the centre we become out own axis mundi, connecting heaven and earth with our body and intent. The axis mundi appears in many ancient cultures, some of which are familiar to us as modern practitioners but there are other which emerge from cultural past of the Abrahamic religions. 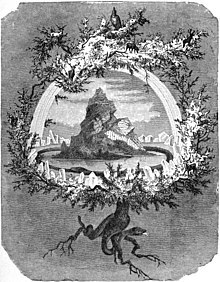 The most recognisable is Yggdrasil, the World Tree. Yggdrasil connects the nine realms of Norse cosmology through its roots, trunk and branches and it is through these that the “shaman” is able to travel between and communicate with these different realms. The Djed, or Spine of Osiris, represents the axis mundi and reminds us that not only do we carry our own axis mundi at all times but we are the centre of our own cosmology whilst in the sacred space. Another expression of the spine as our own personal axis mundi can be seen in the placement of chakras over the body, through which life energy, or prana, can flow. The Asherah Pole is the physical representation of the mother-goddess Asherah, consort of the Canaanite god El. The Pole, which is most likely to have been made of wood as the instruction from God to Gideon in Chapter 6 of the Book of Kings explicitly states that the Asherah Pole by the altar to Baal should be “cut down”. This makes it highly probable that the pole is a stylised tree, strengthened by the fact that places associated with the worship of Asherah are referred to as ‘groves’ in many biblical texts. Jacob’s Ladder is the name given to the stairway described in Genesis 28: 10-19 and has several interpretations within Christian, Islamic and Jewish texts. In addition to being a literal and figurative bridge between heaven and Earth, it is taken to represent the figurative and literal path towards acceptance into heaven through the strictures of that faith. Not only could the human soul travel towards the Heavens but Heavenly Beings such as angels are able to descend to walk alongside the prophets of God. The Spindle of Necessity from the Myth of Er is another example of the axis mundi. As well as representing the cosmos as understood by the ancient Greeks the Spindle and the thread it spins forms one of the many axis mundi found within the Classical world. To make it easier to understand I will approach this explication in two elements. The Spindle and the scene of Necessity represent the observations of Natural Science and the understanding that the ancient Greeks held about their observable universe. > The Rainbow represents the qualities of white light when broken down through refraction. >The Spindle represents the visible rotating movements of the seven classical planets and the ‘fixed’ stars or constellations, placing the Earth at the Centre as is common in natural scientific observation. > Each ring is also described as having its own rotation and individual speed which reflects the time it takes for the planet to rotate fully around the Earth or, by modern understanding, the Sun. The colours associated with each ring matches the observable colour of the Planets. > Upon the spindle sit seven singing nymphs, representing the seven notes of the musical scale. > The three Fates Lachesis (past), Clotho (present) and Atropos (future) joining in this harmony with tales of the past, present and future even as they guide their mother’s spindle. Here the Fates represent the nature of observable time being a linear progression. After the description of the Spindle itself comes the explanation of its function in the rebirth of the soul. Each soul is allowed to choose the nature of his next life, be it that of a man or an animal, based on the experiences of the life, which have either been rewarded or punished based on the divine judgment. After affirming this with Lachesis they approach Clotho who guides them into the spindle itself, setting their chosen fate firmly within their soul, from where they become part of the thread of Necessity as spin by Atropos from where their assigned fate is assured and they are carried down the thread to travel plain of Forgetfulness to drink from the river of Unmindfulness before their rebirth in the mortal realm. The Spindle becomes an effective method of transmitting the soul from one state to another and, by extension, a method of connecting the realm of spirit and that of man. Although the myth only refers to the spindle as a vehicle of rebirth I have drawn a connection between it and one expression of the Neoplatonic World Soul, the Heavenly Chi (X). The Neoplatonic World Soul is far more complicated than the Chaldean World Soul in the sense that it relies on complex (for me at least) mathematics and special relations. Sufficed to say that in Timaeus Plato describes the World Soul as being reflected in the appearance of a stellar conjunction known to appear in the heavens over Greece twice a year. This conjunction, referred to as the Heavenly or Celestial Chi (X) reflect the alignment of the entrances of the celestial and chthonic entrances through which the spirits may travel. I find this form of the World Soul also in the Myth of Er, although it is depicted as two openings in the Earth and two openings in the Heavens. These two portals function as an entrance and exit for the soul as they experience their judged punishment or reward based on the life they last led. The Heavenly Chi (X) is almost certainly the appearance of the zodiacal light in the spring and autumn skies over the precincts of Eleusis. Some scholars posit that the appearance of this heavenly event contributed to the timings of both the Lesser and Greater Eleusinian Mysteries, particularly as that within the ceremonial landscape of the mysteries sits the Cave of Hades, a semi-circular cave held to be one of the descents into the Underworld. For myself, I see descending through these portals the Spindle of Necessity, the axis mundi through which it is possible to ascend to the realms not only of Heaven and Underworld but to that of the spirits of those who have gone before us. Although this is not in keeping with the original application of the Thread in the Myth of Er I have found it useful in my own practice, particularly as I see Hekate Triformis stood around the Thread itself. In this setting Hekate is both the Guardian and Gatekeeper of the World Soul and is the agent through which communication across the Three Reams is possible. Another way I like to envision this role of Guardian of the axis mundi is in the depiction of Hekate Triformis stood around a central pillar, occasionally with the three Charities. This form of depiction is often referred to as a Hekateion. In my view the central pillar is the axis mundi, either in the form of a simple pillar rising and descending into the realms around us, or as the Thread of Necessity. Again, I have found this image a useful tool in walking the realms in the company of Hekate. This entry was posted in Hekate, Musings, Spinning and tagged Axis Mundi, Hekate, Myth of Er, Plato, Spinning. Bookmark the permalink.